If anything characterizes the face of Florida’s landscape, it is the proliferation of shopping malls of all types. Generation by generation, as population swelled, country roads widened into highways and each intersection seemed to blossom into four parking lots framed by strip centers decorated with small, freestanding stores and restaurants. These malls represented the prosperity of the American middle class. Now that consumerism has slowed and been rechanneled online, new malls aren't being built and the existing ones are looking a bit dog-eared, with shuttered stores, empty parking lots, and aging facades. Repurposing the American mall is a huge opportunity waiting for the right moment, and represents an opportunity to heal much of Florida’s economic stagnation. As the car culture rose after World War II, malls – convenient places that fit our newly prosperous lifestyle — rose as well. Thinkers, sentimental about the hard work that went into an organic, localized Main Street were largely horrified at its replacement by strip shopping centers and regional shopping malls. Yet this growth continued unabated, and while the debate over the mall’s moral stance raged, the building type continued to be a popular investment vehicle. It became codified and regulated into a more and more complex, layered experience, dominated by traffic and parking, manipulated by industrial psychologists, and fine-tuned by mall managers so that the best possible presentation of goods was made to the consumer. The consumer was unsentimental about the architectural debris that was left in the wake of the flight to the suburbs. As old village streets saw local businesses shuttered, cries of “Too hard to find parking” and “Why are your prices so high?” echoed on their sidewalks. Purposeless old Main Street: The lucky ones became tourist destinations, filled with chocolate shops and art galleries. Here in Central Florida, the lucky ones include Mount Dora, Sanford, and Ybor City, where parking lots and garages have been surgically inserted into the back alleys, a rigorous code enforces the form, and hand built architectural details from America’s Victorian era still surprise and delight. The consumer will continue to be a strong component of the American middle class, and no doubt many malls will continue to thrive. Florida’s oversupply has attracted tremendous attention, and repurposing raw space could become a creative new way that cities will grow. Winter Park Village, a 1960s indoor regional shopping mall, was cut open and now features a mixed-use shopping, dining, entertainment, and residential space barely resembling its former self. Metro Church in Winter Springs occupies a former Belk-Lindsey department store, with church-related functions occupying what was once a general lease area. Full Sail University in Winter Park is largely housed in converted strip centers as well. These conversions are not unique to Central Florida, and will likely continue into the future. The biggest opportunity, however, seems untried as of yet in America: manufacturing in a mall. Production, much more than consumption, creates jobs, and the raw open space of old retail sites can be easily converted into industrial uses. Geography is in their favor. Malls were typically built if at least 3,000 surrounding households could be found to support them; today these households could provide labor, instead of cash, to the right investor looking to onshore a product. Aligning industry with opportunity seems difficult on the surface. Manufacturing investment abounds in relatively unregulated India, but with the huge sunk costs that American industry already has, startups and expansions seem to be nonexistent. Turning this around would require a fundamental shift in American culture, allowing us to think of ourselves as producers once again. American know-how hasn’t vanished; rather, it lies dormant underneath the heavy regulatory burden, and under the high barriers to entry that our manufacturers created in their quest to be the largest and to shut out competition. New products are being created every day… overseas. If investment isn’t coming from within America, perhaps the right NGO sponsoring microloans could be tapped to consider the broken, declining landscape of suburban America to reinvigorate our natural American creativity and give small scale capital access to startups. Selecting the industries that we want to have, re-onshoring them, and producing things people need would once again provide jobs, diversify the local economy, and create the kind of upward mobility we once counted on for the American Dream. And the physical plant – one of the biggest investments that a producer makes – is already there. The regulatory burden of redevelopment, shouldered by the initial developer, should be minor at best, depending on the quality of the infrastructure, which would speed a conversion into reality. At a time in Florida when growth is on pause, the redevelopment of existing assets is likely the most favored way to provide economic expansion and pull Florida out of its nosedive. Mall redevelopment would please the environmental movement, as well. Huge swaths were cut into the Florida wilderness to make way for retail, with nary a peep from environmentalists in the eighties and nineties. One of the tenets of sustainable development is to confine construction to areas that are already strongly modified by human activities, and repurposing abandoned space fits this mandate to a tee. Florida, with its abundance of unused retail space, has an opportunity to become a leader if it can attract the right kind of investor. India, with all its problems including ethnic strife and the lingering caste system, is certainly not waiting for opportunity to create its own future. China, with its authoritarian regime, has surged ahead in terms of entrepreneurial spirit that seems sorely lacking in America at the present moment. Seeing gold in a dead strip mall may seem farfetched, but out of opportunities like this we can reinvent our own future and fuel a renaissance of the American dream, one mall at a time. 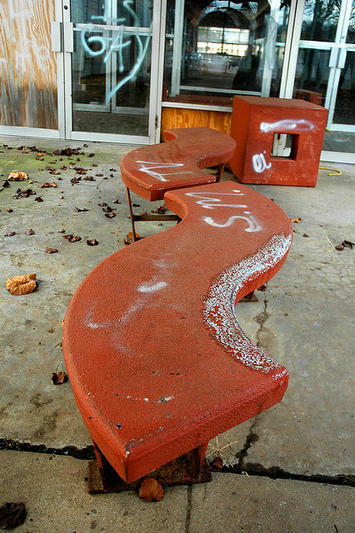 Photo by Clinton Steeds: Phoenix Village Mall, Ft. Smith - Bench at Back Entrance. The photographer writes that it was the first mall in Arkansas when it opened in 1970, adding, "It has so far failed to live up to the "Phoenix" part of its name". Submitted by davebarnes on Sat, 01/29/2011 - 09:52. I love your writing and this transformation idea is very intriguing. Submitted by Dexter on Mon, 12/03/2012 - 11:11. I think that opening a business nowadays where you want to be a retail provider requires you to have a memorable proposal for your customers. The competition is so dear that you simply can't survive.